Identification: Fringes are brown. 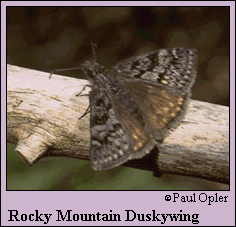 Upperside is brown; forewing has gray scales and distinct clear spots. Underside of hindwing has very small spots below the apex. Male has a costal fold containing yellow scent scales; female has a patch of scent scales on the 7th abdominal segment. Life history: To seek females, males perch in gulches during the day. Females lay eggs singly on the bark and leaf buds of the host plant. Flight: One brood from April-July. Caterpillar hosts: Gambel oak (Quercus gambeli). Habitat: Oak woodland and openings. Range: Southern Wyoming, Utah, southeastern Nevada, Colorado, Arizona, New Mexico, and west Texas.